Sixty years ago, a high level spinal cord injury was often considered by society to be a career-ending catastrophe. Many SCI patients were left bedridden. Others suffered complications due to pressure sores, the result of being in a traditional wheelchair without frequent movement and weight shifts. But Don Rugg, who was paralyzed in an automobile accident in 1954 shortly after his college graduation, didn’t let the challenges of his quadriplegia stop him. Instead, the young electrical engineer went on to receive a doctorate and worked for many years on faculty at the University of Denver’s Denver Research Institute, conducting classified research for the U.S. military. His projects included circuit design for missile controls and antenna design for VLF radio used to communicate with submerged nuclear submarines. In the late 1950s, Rugg and colleague Bill Orr designed a reclining power wheelchair, a device that would become instrumental for the spinal cord injury rehabilitation program at Craig. It was patented in 1965. The “Independence” or the “Rugg Chair,” as it became known, featured a reclining mechanism that could be adjusted to any desired position between a substantially upright and a full reclining position without effort or physical shifting of the occupant in any way. According to the patent, the chair was constructed and arranged “to closely conform to natural body movement when being raised or lowered to the desired disposition and relation.” This reclining ability made it possible for Rugg to shift his position and work long hours in his laboratory without risking pressure sores. While not widely commercially produced, the technology helped many other Craig patients. Falcon Manufacturing hand-built approximately 20 of the chairs, using motors and gear drive assemblies made from surplus WWII aircraft parts. 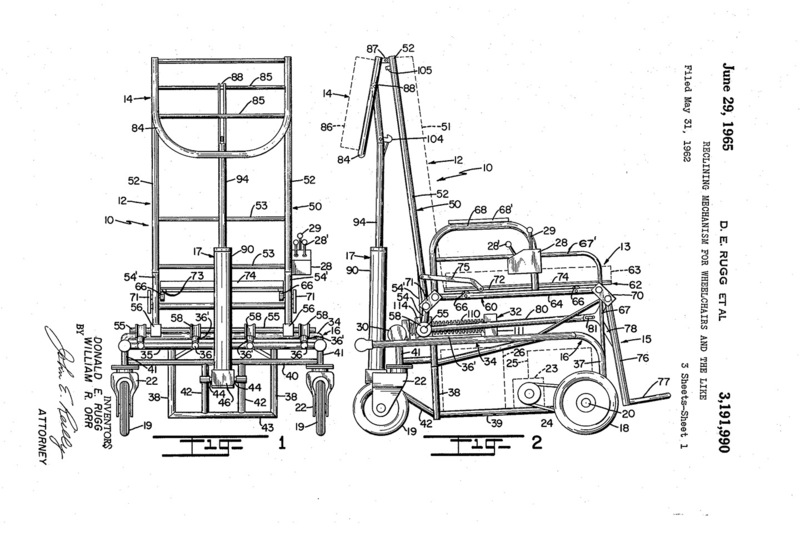 Rugg and Orr were paid $25 per chair for use of the patented reclining mechanism. In the 1970s, Rugg also contributed to the development of an ocular controller. Patented in 1979, the Occucom was a microprocessor controlled communication system for individuals who do not have the ability to write or speak. The controller could read eye movement and translate the movement into action, controlling lights or appliances. It also could be connected to a printer or voice synthesizer allowing for communication. The project received funding from the National Institutes of Health to be tested with Craig Hospital patients. The Don and Melba Rugg Assistive Technology Lab at Craig Hospital was named in honor of the prolific inventor and Craig graduate. In memory of the couple, Michael Durham and his wife, Dr. Jan Durham, have donated $1 million to Craig’s Redefining ROI Campaign to name the Don and Melba Rugg Assistive Technology Laboratory in the new west building. The Durhams chose to name the assistive technology lab after the Ruggs as a way to honor their legacy and help inspire future patients. The lab was dedicated on April 11. In the new space, lab staff will teach patients how to use state-of-the-art equipment to be as independent as possible.